MacBook Pro with Core i5 and Core i7 Processor is Here at Last! 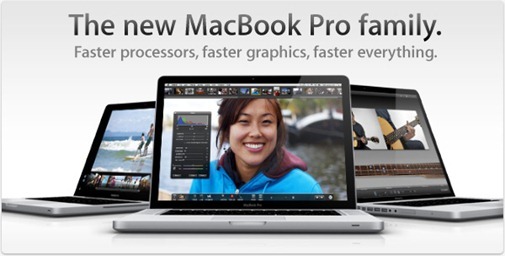 Apple has finally unveiled the new MacBook Pro family which is powered by Intel Core i5 and Intel Core i7 processor. However the Core i5 and Core i7 option is only available for 15.4 and 17-inch models. The more popular 13-incher disappointingly stays on Core 2 Duo. Apart from the upgraded processors, all the new MacBook Pros starts with a minimum of 4GB of RAM, with NVIDIA GeForce GT 330M graphics with 256 or 512 MB of video RAM for 15.4 and 17 inches model, while the smaller one gets NVIDIA GeForce 320M graphics. Apple also now claims 10 hours of battery on a single charge for the 13-inch models, and 8 to 9 hours for the 15.4 and 17-inches MacBook Pros. The 15-incher also gets to choose between three different types of screen: Glossy Widescreen Display (1440×900 pixels), Hi-Res Glossy Widescreen Display (1680×1050 pixels) and Hi-Res Antiglare Widescreen Display (1680×1050 pixels). As far as the prices are concerned, the base model for 13-inches model starts at US $1199, 17-incher at $2,299 and 15-incher for $1799. MacBook Air with Core i5 Upgrade?